Baby sleep problem – How to solve? Can’t it be unbearable if your eight month old baby repeatedly wakes up at night? You get tired and stressed and the relationship with your partner suffers. Unfortunately baby sleep problems can persist for many years. So it is important to teach the infant how to get to and stay asleep. If the baby sleep problem carries on, it could be embarrassing later on. A woman was walking in Paris when her toddler climbed into her arms, reached under her shirt to hold her breast, to then fall asleep. The self-conscious mother says this is the only way he can nap and she carried him around in this position for the next three-quarters of an hour. This account is told by Pamela Druckerman in her book French Children Don’t Throw Food. Yet some parents assume that being up half the night with an eighth-month-old is a sign of parental commitment rather than acknowledging there is a baby sleep difficulty. This despite the fact that in some countries like France having a baby of over four months of age who has learned to sleep through the night is the norm. So how can this be? Why do some infants stay asleep whilst others don’t? The reason seems to be something to do with the behaviour of parents. 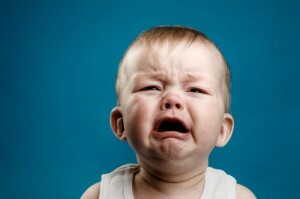 Many in English speaking countries are opposed to letting their babies cry even a little. They believe babies cry because they need something and it is uncaring not to respond immediately. We might wonder if an element of unnecessary guilt has crept in? Infants wake up between their baby sleep cycles, each of which lasts about two hours. It is normal for young babies to cry a bit when they are first learning to connect these cycles. The danger is easily learning to depend upon an adult to soothe him or her back to sleep after each cycle. If an infant manages to fall back asleep on their own even once, it will be easier to do it again the next time. And of course the baby may feel hungry and want a feed. But that doesn’t mean there is a need to be fed. The stomach needs to take a rest too. We can all learn to fast at night and have ‘breakfast’ in the morning. For some reason, many parents assume that for quite a while they should rearrange their lives around the baby’s whims. But surely a bit of frustration won’t crush the child. To always respond to baby sleep demands means they won’t learn what is expected of them; will never learn self-control and deal with frustration. In fact experts say that learning, done gently, isn’t damaging. Sleep researchers like Jodi Mindell, who has conducted a review of numerous studies into baby sleep, suggest infants from a few weeks of age need their parents to adopt an active role in teaching them to sleep well. Most paediatric academics like Teresa Pinella offer similar advice. In the early months keep babies with parents in the light during the day even for naps and put them to bed in the dark at night. Helping the infant learn the difference between day and night means for example not holding, rocking or nursing the baby to sleep in the evenings. This is all part of what these days is being called mindful parenting. This deeper watchfulness is a form of spiritual discipline: staying in the moment, and being alert to deeper issues, rather than mindlessly jumping to judgment or being attached to what you hope for. Unless we pause and observe the baby we won’t know if he or she actually needs help. This doesn’t mean letting the infant wail all the time but just giving him or her a chance to learn. Even young babies need to learn to wait for attention – after all, accepting we don’t always get what we want when we want it, is a normal thing we experience in life. If they expect immediate gratification they won’t learn to relax and drift back off to sleep. And when it comes to sleeping, even young babies need to learn to be separated from their parents for a few hours. You can let go of consciousness if you are easy about being alone. Parents pausing and observing amounts to sleep teaching. However if this is not done and bad habits persist, then after four months of age an infant who doesn’t sleep all night probably needs a special graded exposure programme using some form of ‘controlled crying’. This involves gradually extending the time before getting up out of bed to the child. The lengths of time the baby cries before falling asleep will reduce over several nights. To work it requires parental consistency. Guilt — Why won’t it go away?